Diamond Details: Round brilliant cut white diamonds of F color, VS2 clarity and excellent cut and brilliance, weighing 1.58 carats total. Measurements: Finger size 6.5, and 6mm wide. This ring may be ordered to any finger size, some of which may be special ordered, requiring approximately 4-6 weeks to deliver. 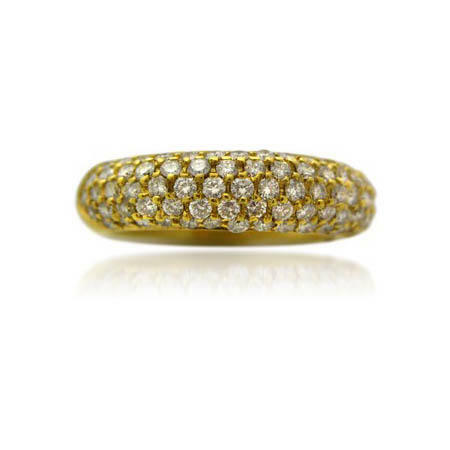 This breathtaking Leo Pizzo 18k yellow gold wedding band ring, designed in Italy, contains round brilliant cut white diamonds of F color, VS2 clarity and excellent cut and brilliance, weighing 1.58 carats total. A marriage of inspired design and masterful craftsmanship. This ring, which is size 6.5 and 6mm wide, may be ordered to any finger size. Some sizes may be special orders requiring approximately 4-6 weeks to deliver.